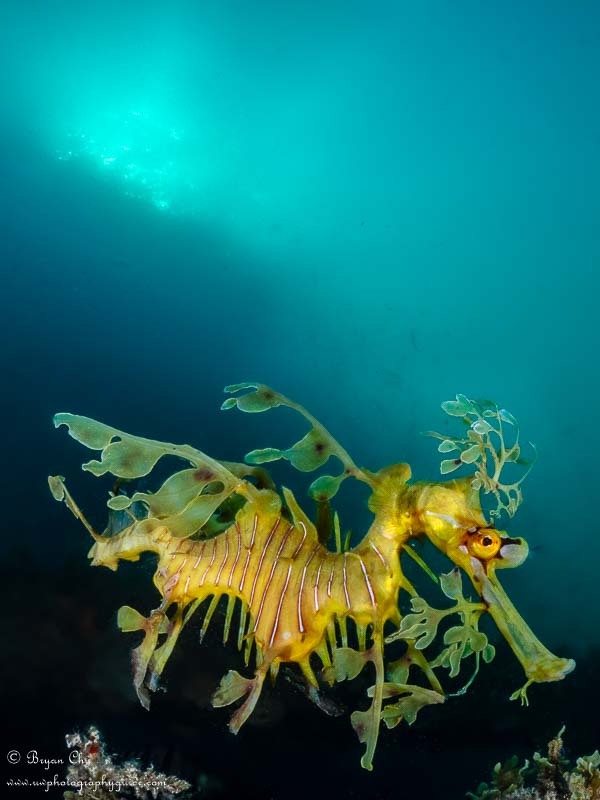 Diving Rapid Bay, South Australia, in search of the perfect leafy sea dragon shot. Editor’s note: for those looking for the 5th book of the Game of Throne series, A Dance with Dragons… this is not related to that. Although this piece also involves dragons, they are of a rather more diminutive stature. The word “dance” usually brings to mind beauty and grace; the classical stylings of a waltz, the smooth and fluid 1-2-3…5-6-7… of the salsa, the sophisticated elegance of the Argentine tango. But “dance” can also refer to when a shy college kid with no moves has a few too many shots of liquid courage and tries to impress the ladies. I will let you decide which definition is more apt here. Adelaide, South Australia - famous for two of Australia’s wonderful, strange and unique underwater critters: the leafy sea dragon, and the striped pyjama squid. We connected with Diving Adelaide, and were hooked up with the best of the local dive scene, rental gear, and some guided dives. We also did some self-guided dives, paying a number of visits to the local leafy sea dragons. Although Rapid Bay sounds like it should be a very happening place, it is in fact rather dull above water. The highlight is probably the nice public bathroom at the campground. There are two jetties: the new jetty, for fishing, and the old jetty, for diving. To get to the old jetty, you walk to the end of the new jetty and head down a set of stairs to the water. From there you swim across to the old jetty, as that is where the bulk of the sealife is. During our first two dives at Rapid Bay, Brendon was our guide. It was a beautiful sunny day, with not a cloud in sight, and a scorching 32 C (90 F) temperature. As the water was about 19-20 C (66 – 68 F), we had to wear 7mm wetsuits. After gearing up in the parking lot, we commenced the first movement of the Rapid Bay Suite: The Sweat Slog. The Sweat Slog: walking 300 m in the scorching sun through the parking lot, along the new jetty, and down the stairs to the water. Your 7mm wetsuit does a great job of trapping heat against your body, resulting in a profusion of sweating. Your weights weigh you down. No matter how much you remind yourself that your camera rig is “so effortless and neutral” underwater, your arms slowly sag under the weight of carrying it all out of water. As you tire from the heat, your steps become smaller, and your grin becomes clenched. You lament ever having passed the age of 30, when everything started to go downhill. Following the completion of the first movement, relief was found in the shade beneath the jetty. After putting on our fins, we entered the second movement of the Rapid Bay Suite: The Grateful Chilling. The Grateful Chilling: overheated from the sweat slog, you slide into the water with immense relief, only slightly wincing as the cold 19 C water runs down your back. Temperate water has never felt so great. Take Me To Your Dragon! After a short swim over a sandy bottom, we reached the old jetty. Although condemned and falling apart above water, it is beautiful below water. This took us into the third movement of the suite, The Passage of Distractions. 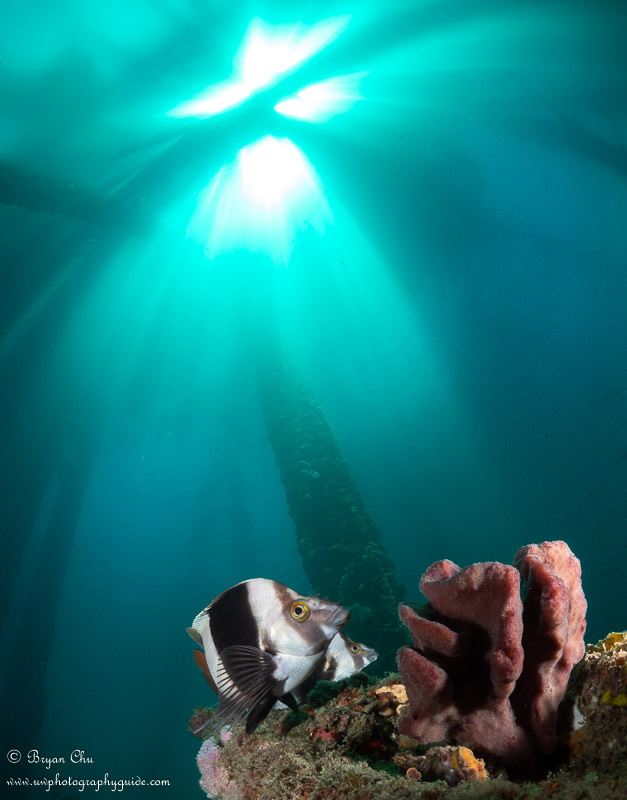 The Passage of Distractions: swimming between pilings covered in life, you admire the abundant schools of fish and the striking patterns of sun rays filtering through the gaps in the jetty planks. Extending from either side of the jetty are swaying beds of seagrass. 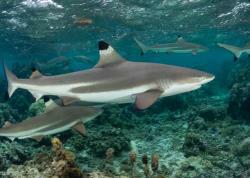 They promise untold riches of juvenile fish and other exciting subjects for those patient, lucky, or stubborn enough. You want to take photos…but you are here to see the dragons. So you try not to get too distracted, and keep up with the guide. We followed Brendon to an area on the outside of the old jetty very appropriately called “the grid" - an area with steel girders laying on the bottom, forming a grid pattern. Almost as soon as we arrived, he spotted not one, not two, but three leafy sea dragons! It was a bit of a surprise to see our first dragon. It was about 25-30 cm long, so quite a bit larger than what you might envision on seeing a photo. 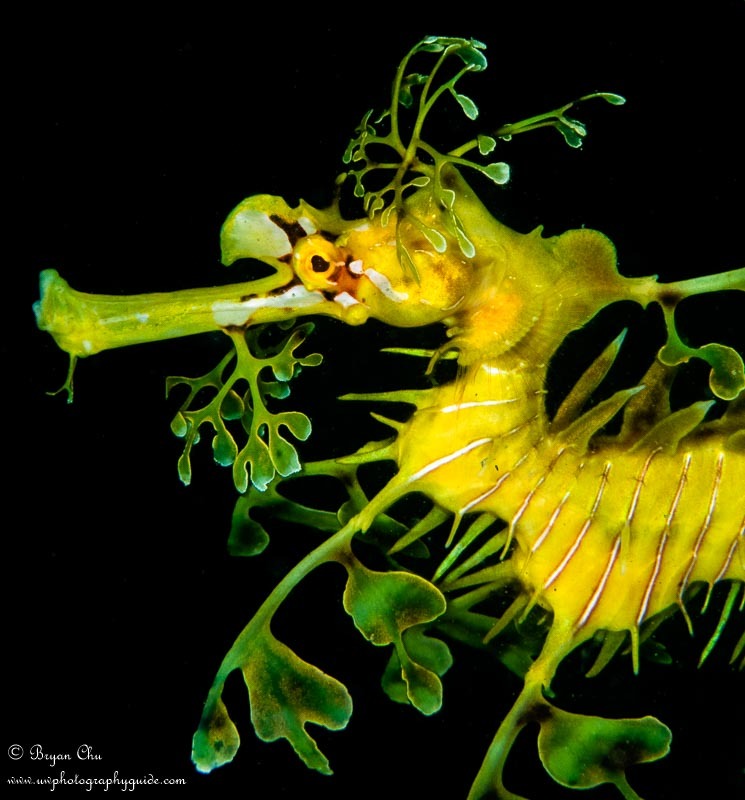 For lack of a better descriptor, it looked like a seahorse on a major steroid program, combined with a big clump of green seaweed. 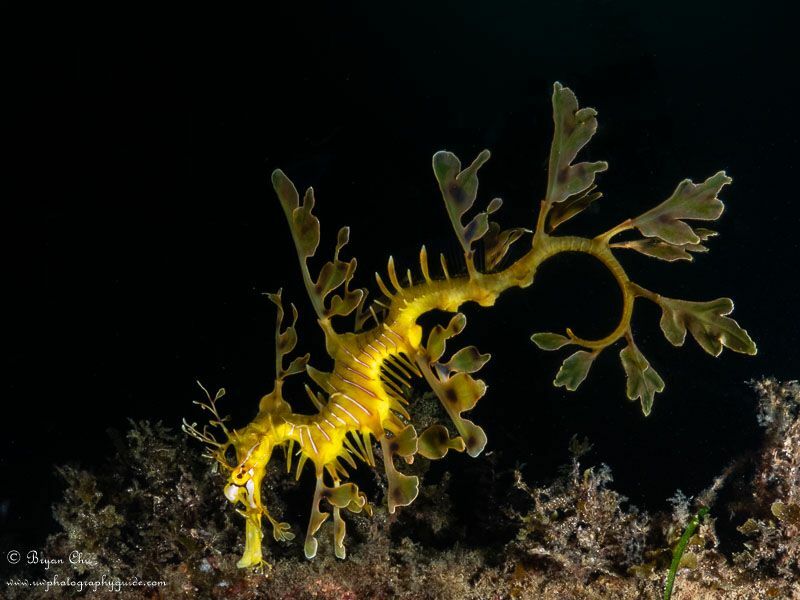 And although I had expected it to be hiding in the weeds and seagrass, like a seahorse, each one that we saw was just puttering around in the water, hovering slightly above the bottom, with head down and tail up. It was at once strange and beautiful. I set up my camera, pulling my strobes in close to the port. I knew that I needed to be able to light a dragon right against my port if I got it that close, and took a couple of test shots of a girder to make sure I had my exposure set properly. Not a good setup for backscatter, but I would rather have some backscatter than a half-lit dragon. 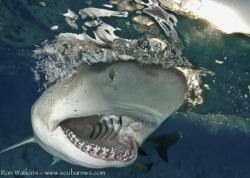 I then moved in towards a male with eggs (!) hanging out in the grid, beginning the fourth movement of the suite, The Dragon Dance. The Dragon Dance: approaching slowly and calmly, you try to get as close as possible to the dragon. Wanting to shoot upwards to get a nice background, you push your camera down against the bottom. The crafty dragon sees you coming, and slowly turns away from you, keeping its tail pointed at you and head buried in the weeds. You circle to the right; the dragon turns to the left to keep its head away. You circle to the left, and the dragon turns to the right. You go over the dragon, and as you come down in front of it, it is already turning away just a bit too quickly. Although it is cute, you cannot help getting mildly infuriated by the dragon’s continual thwarting of your photo plans. After squeezing off a few rushed shots, taken blind, you stop to give the dragon a break, so as not to stress it out (especially if it is a male carrying eggs). I then attemped to photograph the other dragons, but all too soon it was time to head back. Thus began the fifth movement of the suite, The Thermal Inversion. The Thermal Inversion: for anyone who gets cold easily, you feel the chill as you leave the dragons and swim back along the old jetty. By the time you reach the fishing jetty to get out of the water, you are chilled and looking forward to the heat on the surface. And as you walk back to the parking lot, feeling old and slow, you start to warm back up in. Upon returning to the parking lot, the final movement of the suite began: The Dance of Flies. The Dance of Flies: you take off your gear at the vehicle, change tanks, have a snack, and drink some water - all the while waving one hand in front of your face to keep the friendly flies off. Rapid Bay has very friendly flies; they don’t bite, but they do want to be your friend, and they express this by walking all over your face. For our second dive, we repeated the Rapid Bay Suite. This time, I started off with a non egg-carrying dragon in the sea grass. Not having any barriers or obstacles, this dragon was very successful at keeping its head completely away from my camera. Frustrated, but not letting my frustration carry over into harassing my subject, I went back to the grid to try a different subject. As I approached one by the grid, it did its usual turning away move. But then as it came to a girder in front of it, instead of just staying around the bottom with its head in a corner, it went up and over the big piece of metal! This let me get my camera in to shoot upwards into the blue. Not perfect, but not bad. After processing the photo, I wasn’t quite satisfied with the color of the background. I realized I had forgotten one of the most important steps – white balance! When shooting with strobes, if my subject is well-lit, then I usually don’t need to worry about modifying white balance from the “as shot” mode. But in some cases, a tweak to the white balance can make a big difference to the photo. This was one of those where, I felt that doing a custom white balance really made a big difference to the final product! After reviewing my shots from the first couple of dives, I decided I needed to mix up the background. Backgrounds are like the background dancers in a music video. Although they are not the focus, they make the whole video work. It would look very strange to have Britney Spears or the Backstreet Boys dancing by themselves. Or, if not strange, then surely not as compelling. The backup dancers make the scene; the high school kids in Baby, One More Time, the assorted mix of zombies, vampires, mummies and high society (?) people dancing in the mansion in Everybody (Back Street’s Back). I wanted to get a sunball shot and a black background shot. For the sunball shot, we decided to go later in the day. Since it was hard to get a shot of a sea dragon above the bottom, it would have been even harder to include the sun when it was right overhead in the middle of the afternoon. Thus we did our dive around 5 PM, when the sun was lower, so that I could get it into the shot. Once we found a friendly leafy, I set up to properly expose the sun, then got down to the dragon dance. As usual, I was shooting blind, but I was able to get a nice shot with the sea dragon facing somewhat towards the camera, and the sun overtop the jetty in the background! The next dive we did, I focused on getting a shot with a black background. I cranked up my shutter speed and f-stop, got my strobes set by taking some seaweed practice shots, and then went back to the dragon dance. Spice Up Your Life Portraits! 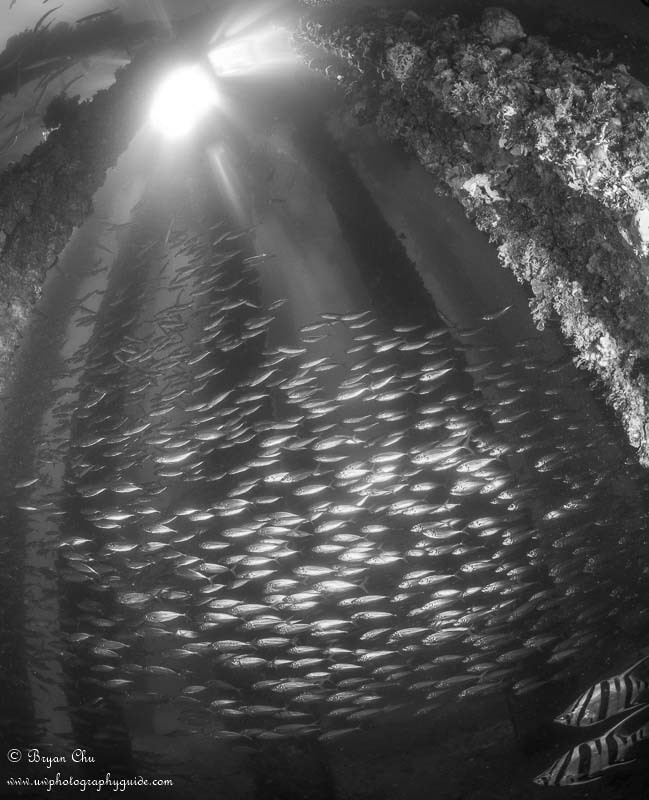 Since we had spent so much time just shooting sea dragons, on one of our dive days we decided to do a dive that focused on exploring an area known as the cathedral, with large schools of fish and beautiful light. I found a couple of upwards compositions I was quite happy with. Black and white really helped make the light and textures in this photo pop. Leaving this in color, the colors on the pilings and the color of the water were nice, but ultimately distracted from the main draw; the light. 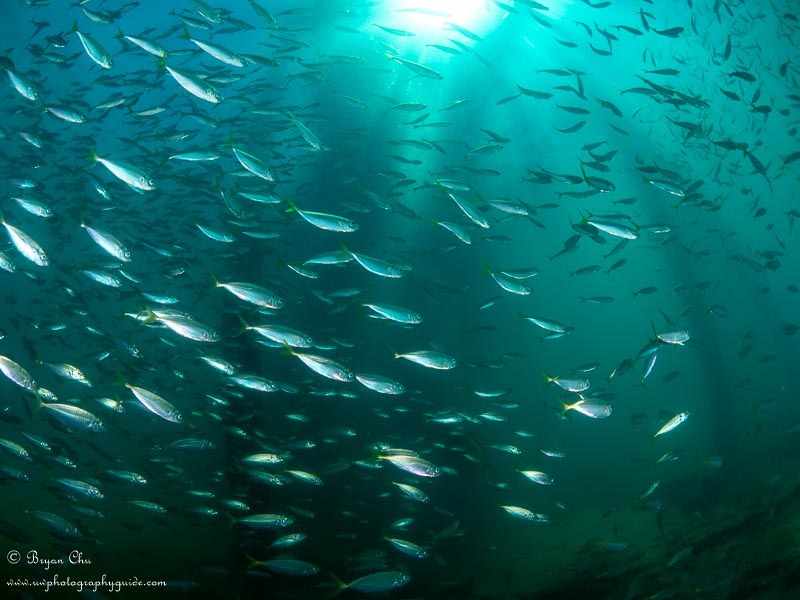 I took a lot of shots with large groups of fish, but really liked this once just for its simplicity, which again emphasized the light. I wish I could have gotten closer to the foreground fish, but they were a bit skittish. These shots are both great reminders of why I always try to spend some of my time at a site with my strobes set up to shoot portrait mode (one strobe above the housing and one strobe below). That way I am forced to take some portrait shots – it is often surprising what forcing portrait shooting will do for composition! For my last two days of diving at Rapid Bay, I had dive guide extraordinaire Dan Kinasz. I decided for the first dive that I would put on my macro lens and try to get a head-on face shot of a sea dragon, with a black background. 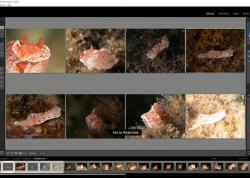 As we got to the grid and I started looking for the sea dragon, Dan pointed out something very, very small. 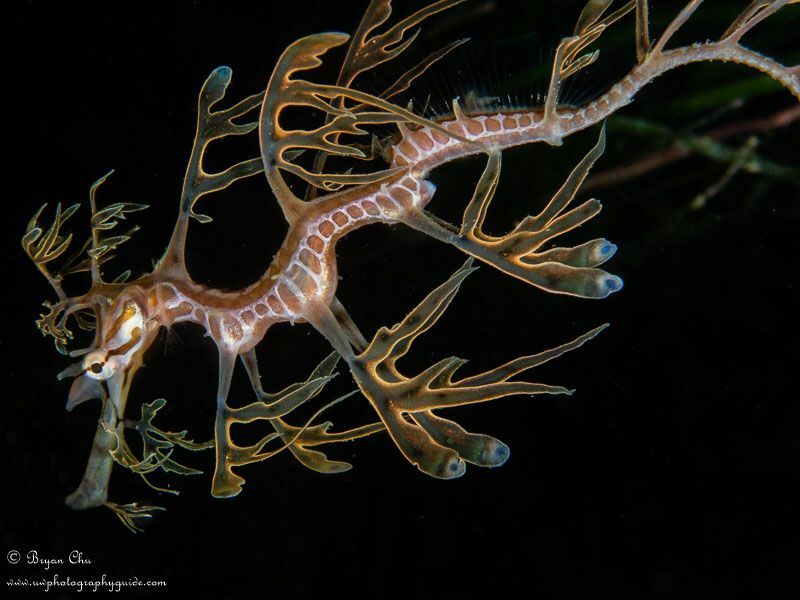 At first I was not sure what it was, but then I realized that it was in fact a tiny juvenile sea dragon. As Rapid Bay can be surgy at times, so I got one good shot before I lost track of it among the girders and weeds of the grid. 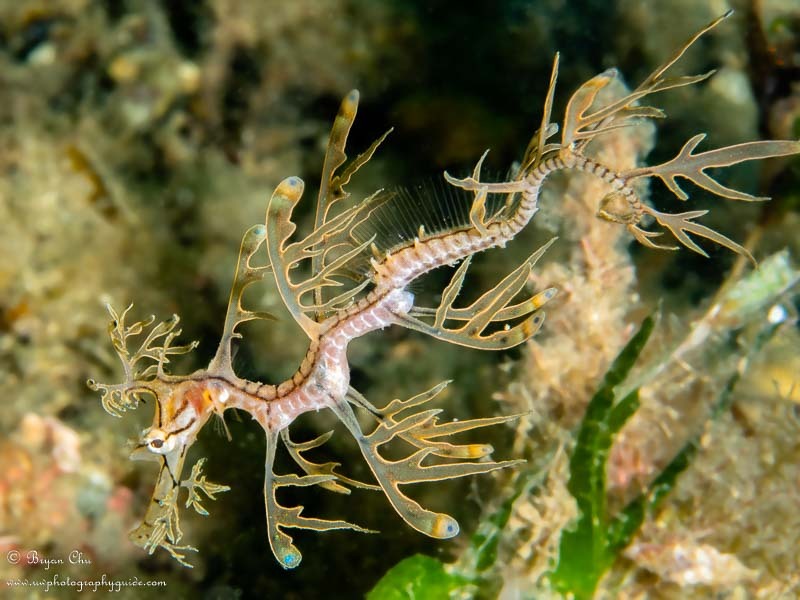 And after the fact I learned from a friend of mine that this was actually a juvenile weedy sea dragon, the only one I saw. Very cool! I did not spend too long looking for it, as I was still very much focused on getting that head-on face shot. In retrospect, I really should have spent more time trying to re-find this little guy, as he was a much better and more unique subject. Ah well. On to the adult. I spent a lot of time with my subject, while also being very careful not to stress it out by crowding it, being too aggressive, or taking too many photos. I was only taking one photo every few minutes, and I could only get a good side shot. I was very close to a decent snout-on face shot, but could not quite get it lined up. Plus my lighting was kind of wacky. For the next dive, we went looking for a different adult, with the plan that we would also stop for juveniles. Soon enough Dan had pinpointed a juvenile, and I was able to get a couple of good shots before we decided that I had spent enough time pursuing it and we should let it go. We then found another adult. I spent a lot of time trying to line up the face shot while taking breaks to back off, so as to minimize the stress. As with most sea dragons this one was a crafty one, and it evaded my efforts. 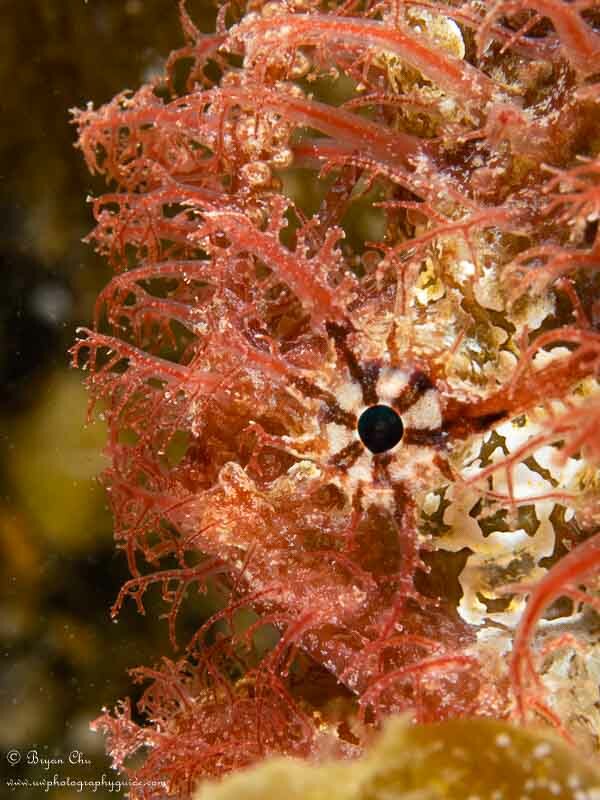 For my last two dives at Rapid Bay, I decided to focus on juveniles only. By this point I had tuned up my skills at shooting moving macro subjects, while learning some things about my auto-focus in the process. Although I had been using continuous autofocus to some level of success, it did not do the job with tracking the always-moving, seaweed-like juveniles. And once I switched over to single auto-focus, I found that holding the shutter halfway would sometimes result in me taking a photo by mistake (thus losing track of the subject and adding stress to it). Instead, I switched to a configuration splitting out the auto-focus from the shutter release, so that I could focus using the AEL button, then hold that focus as long as I wanted while taking photos independently with the shutter. This allowed me to follow the sea dragon over the weeds, keeping it in focus by pressing and holding the AEL button (adjusting when needed), and then take my shot when the best composition presented itself. 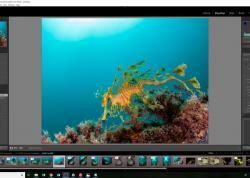 (See Kelli's excellent settings articles for the E-M1 II, E-M1, E-M5 II, and E-M5 on how to set up this configuration). I put my settings to 1/160 sec and f/16, so if the opportunity arose I could get a good black background. I already had a good in-focus full-body juvenile shot, so the first thing I went for was a close-up profile shot. After this, I spent a lot of time following juvenile sea dragons over the sea grass, shooting very few shots - waiting for one to get high enough up for me to shoot it with a black background. As with the adults, the juveniles were continually turning away from me and burying themselves in the grass. Not only did I need to photograph them when they were above the seagrass, but I also needed to get them facing me, or from the side. 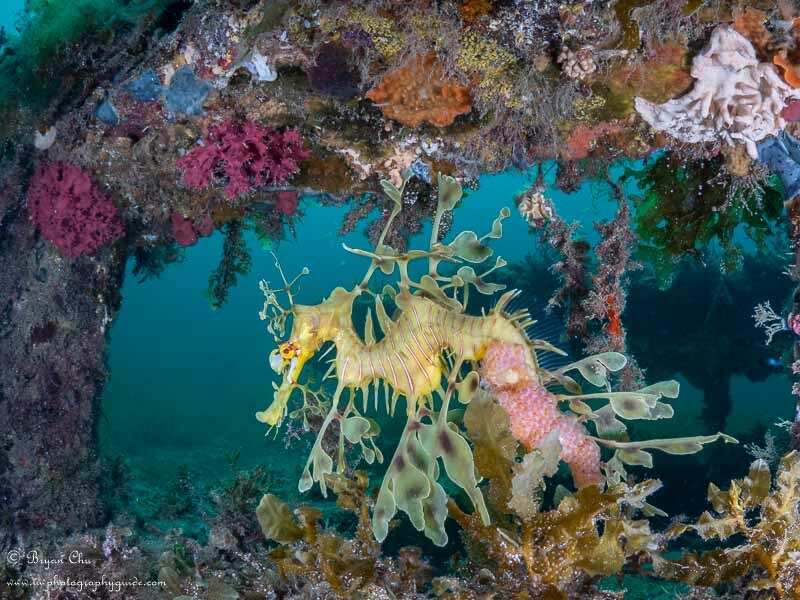 On the second dive of the day, my last at Rapid Bay, I found a sea dragon near a small girder in the sea grass. I tried following it towards the girder, and then swimming around to shoot from the side as it passed over the it. After a couple of tries I was able to get it mostly free of other material, and get the black background shot. It was not perfect, and I did have to remove one piece of seaweed to get the pure black around its face. I was not able to get the whole dragon in the shot either. But it was in focus, had a mostly black background, and had the face. Definitely a fitting end to our time diving with these beautiful, and mildly infuriating fish! We put together a video of our highlights: the plethora of fish beneath the jetty, some "dancing" adult sea dragons, and one juvenile moving over the sea grass. We used the new GoPro Hero 7 Black with its hypersmooth stabilization - yes, it is quite good! And it is always fun to watch those dragons dancing, even if most of the time they hide their face in the grass and turn their tail towards the camera! 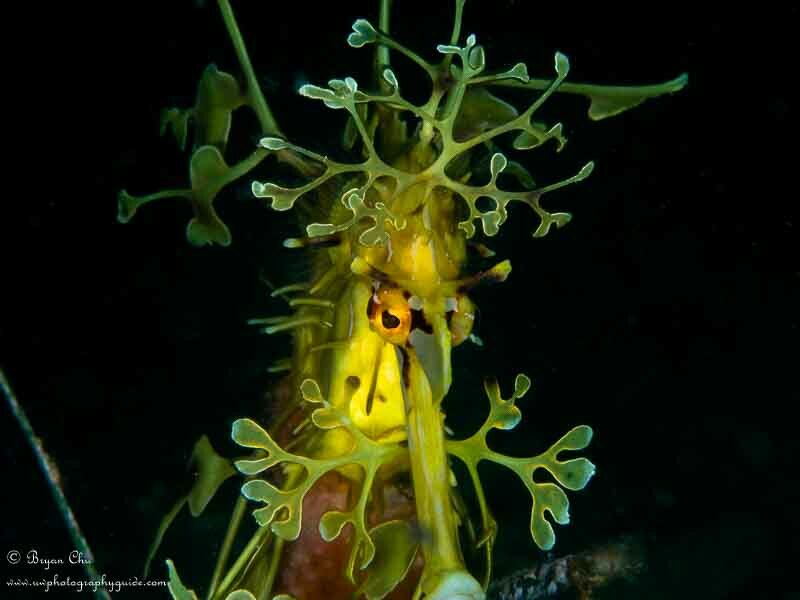 First things first: if you are going to dive with and take photos of leafy sea dragons, please follow this code of conduct! 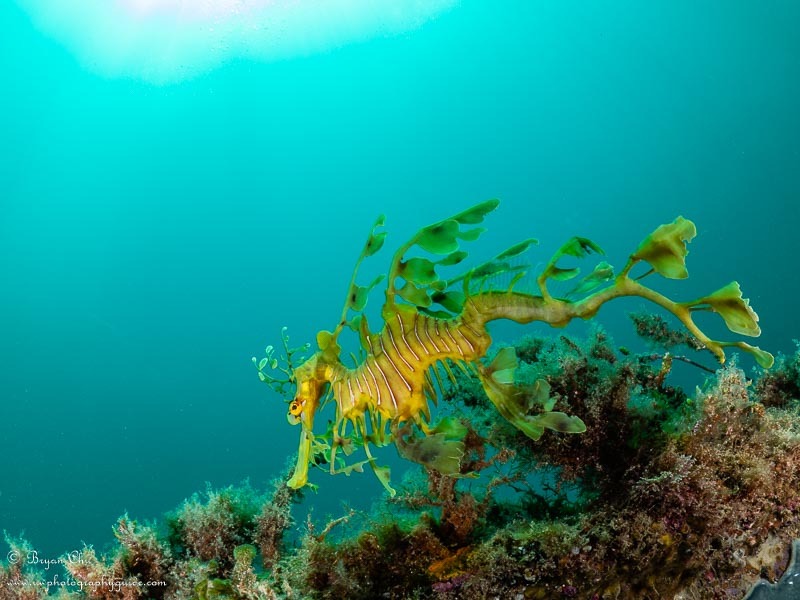 The best sites around Adelaide to see leafy sea dragons are shore dive sites: Rapid Bay jetty and the Bluff at Victor Harbor. 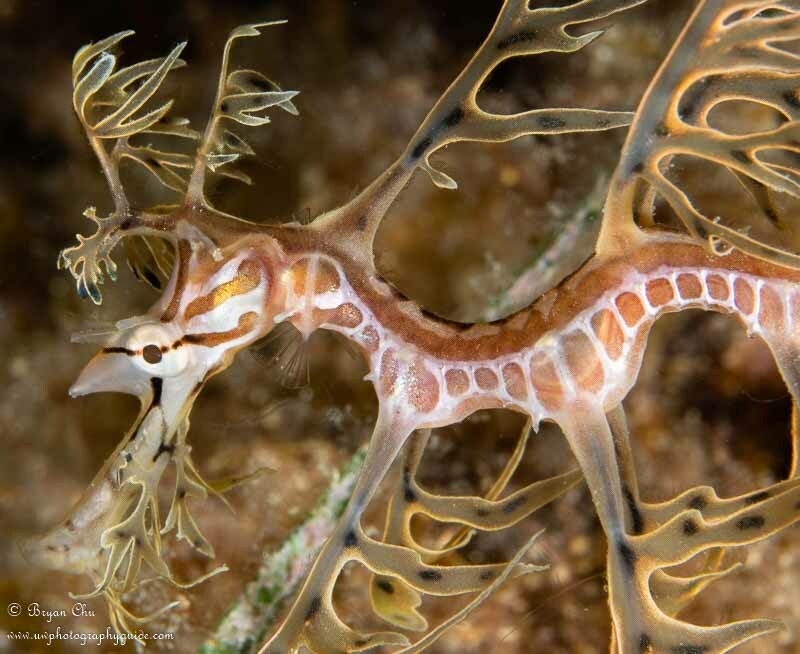 The Bluff has the most leafy sea dragons around (and sometimes weedy sea dragons too) but is very exposed. Rapid Bay has less dragons but is a much less exposed dive, with much better underwater scenery. 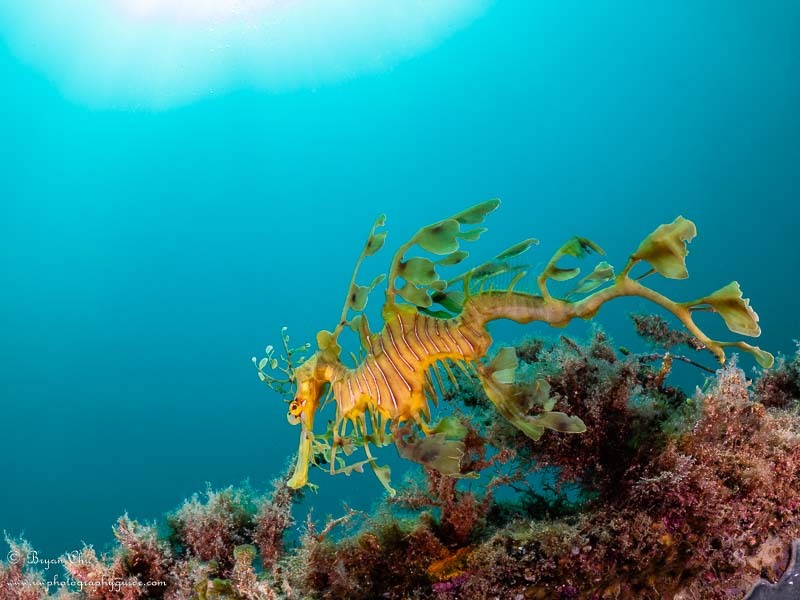 During our time we set aside for diving with sea dragons in Adelaide, the weather forecasts meant that diving at Victor Harbor would be anywhere from uncomfortable and difficult to downright dangerous. So, we did all 10 of our dives at Rapid Bay. 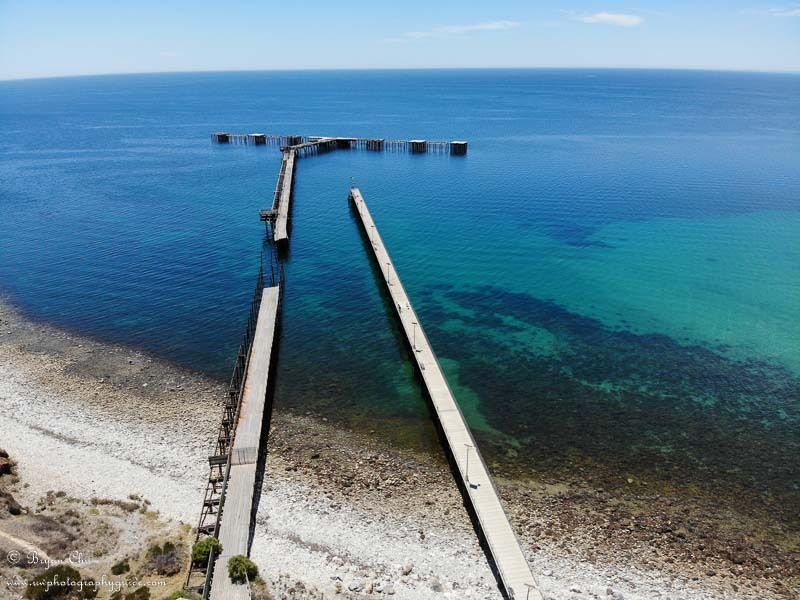 Rapid Bay is a 90 minute drive from Adelaide. 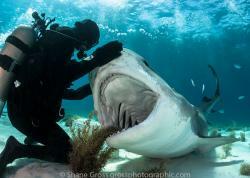 I would highly recommend connecting with Diving Adelaide, as they have fantastic dive guides and run full-service two-tank guided dive trips (leaving at 9 and returning around 4 or 5 - great if you don't want to try driving on the "wrong" side of the road). 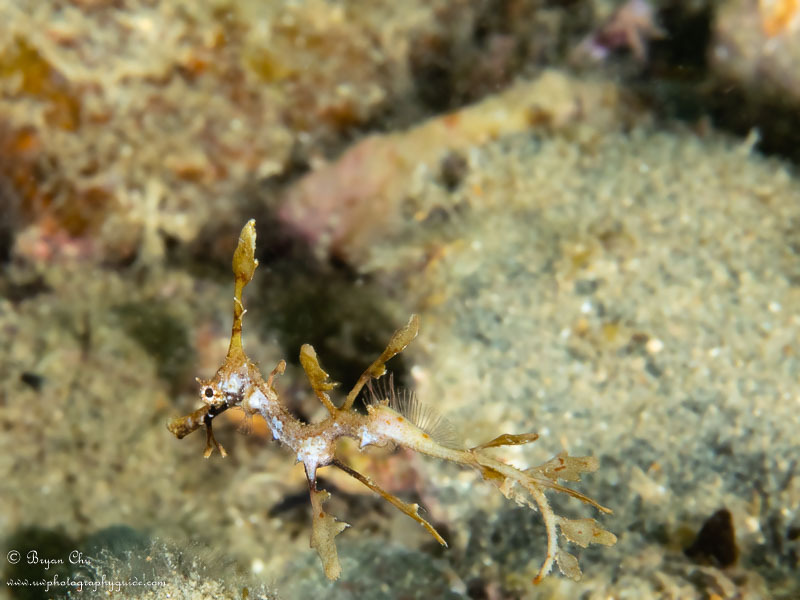 Dan, especially, is a specialist at finding juvenile sea dragons and all things small, tiny, and cool. We were there in late December/early January, which was best for water temperatures, but was also very hot on land. With the walk at Rapid Bay, 2 dives a day was enough - sure, you could do 3 if you wanted, but it would be utterly exhausting, and personally I don't think it would be worth it unless you only had one day to go. In terms of sea dragons, the timing was great, as there was the male with eggs, as well as some juveniles around. The water temperature ranges from 14 C in the winter to 20 C in the summer. It is not warm. The dives are nice and shallow, only going to about 10 m, but even so, we needed a 7mm wetsuit and a hood or hooded vest to keep from getting cold. With a hooded vest though we could do up to 80 minute dives. Shoot me an email (bryan@uwphotographyguide.com) if you plan on trying out any of these items or have any questions about the gear I used. My OM-D E-M1 rig is what I learned underwater photography on, and I would love to chat about my experience and what you might be looking for!